Small and idle, he cut a lonely figure during the recent Delhi street food festival. He must be about ten years old and going by his turban he could be from the deserts of either Rajasthan or Gujarat, among India’s bigger states. With his jeans and jacket, the turban didn’t look all that out of place. Standing in a corner he played with a thread-and-bead toy. Next to him was placed a bioscope, a colourful mock matinee box that contains pictures, videos from films and TV shows, and some background music. A tall man bargained with him, insisting on a discount of ten rupees for a toy he bought for his son. Two women stood behind the turban boy, sharing a quick meal and probably unaware of his existence. But he continued to flash his toys for people who were mostly busy eating. After all, there were 60 food items being offered at the festival that celebrated the multiculturalism of Delhi through its local cuisine. He was at the periphery, really. There was so much to eat. He must have felt tempted, this child, as a throng of visitors fussed over an extra bowl of rice or a snack not warm enough or less spicy. There were kebabs, chicken and mutton curries, all kinds of beverages and sweets. It’s quite possible the boy couldn’t afford to eat there. The cheapest snack cost around 50 rupees, that’s barely his daily income, I assume. But he must have learned by now, for he looked somewhat grown up, what he could get and couldn’t. But he was not that grown up as compared to, say, other shopkeepers in the vicinity, who sold beautiful, velvety and expensive Pashmina shawls from Kashmir, part of India’s vast Himalayan region. They sat equally idle, with not much business to transact. So who was this little vendor, who probably should have been reading in a classroom or having a good time in a play field? What was his name? Where did he live and what were his parents? Was he filling in for them? I didn’t ask him these questions. I took his photo and moved on to the next shot. It didn’t occur to me to talk to him. So what if I wasn’t interested in his toys or that bioscope. 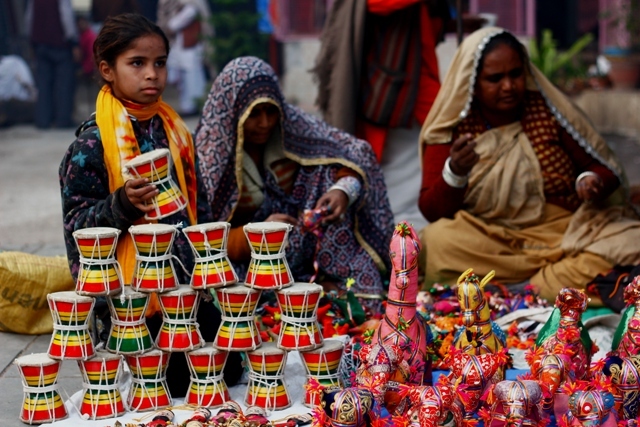 And this girl here, she sold these little musical instruments called damroo. She looked at everyone who walked past her stall. She was curious, perceptive and unassuming too. The women sitting with her couldn’t be bothered with the crowd. Behind them a priest hurled abuses at someone who took a bucketful of water from the shrine he worked for. Did you ever notice and then un-notice someone because that person was of no use to you?